It is a common misconception that linen needs specialist care. This couldn’t be further from the truth, and we want to help you see just how easy it is to care for linen and to keep it looking beautiful for years to come. Made from the fibres of the flax plant, linen has been cultivated and used as a textile for thousands of years, long before the existence of dry cleaners or fancy detergents. In fact, it is such a natural, simple fabric that caring for it is simple too. 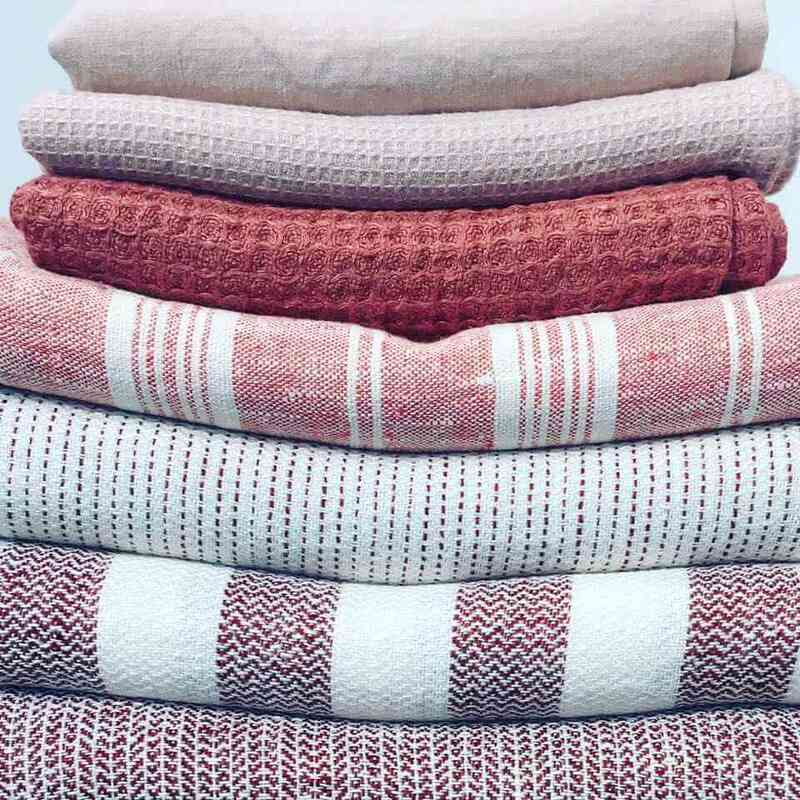 Not sure how to care for your linen clothes or home textiles? Let us help. Do I need to dry clean linen? The easy answer to this is, no. Linen that has been correctly manufactured and treated can be machine or hand washed. It can even be tumble dried on low temperatures. The only garments that are better being dry cleaned are more structured, tailored items such as linen jackets or suits, due to the way they are constructed. Always follow the care instructions on your item, and test any cleaning method on a small, hidden area before washing the whole thing. Why choose linen over cotton? Linen is just as easy to look after as cotton, but it is more durable and gets better with each wash, unlike cotton which can become threadbare as the fibres are weakened. Linen uses less resources in its production, so it is also a more eco-friendly, sustainable fabric. How do I wash linen? Linen becomes softer and more absorbent after each wash, which is pretty neat. Wash linen on low temperatures in lukewarm or cold, and preferably soft, water. Use the gentle machine cycle and a mild detergent to protect the fibres. Again, read the individual manufacturer’s care instructions to be sure. How do I dry linen? Feel free to machine (tumble) dry your linen clothes or textile, as long as you stick to low temperatures. Remove from the dryer when still slightly damp to avoid the linen becoming stiff, and hang or lie flat to finish off the drying process. Do I need to iron linen? No! Yay! There really is no need to iron linen garments, unless they have become really crushed. In fact, we love the inherent natural creases and crumples – they are what give linen its drapey, relaxed, soft feel. But if you love ironing, or have an item that really needs pressing, iron while the fabric is still damp. Use a medium-hot iron on the steam setting. White linen is better ironed on both sides, whilst dark linen should be pressed only on the reverse side. Store your linens in a cool, dry place; avoid plastic bags, cardboard boxes and cedar chests. Linen has inbuilt insect-repellant properties so you should have nothing to fear from moths or other nibbly creatures. When you take linen out of storage, give it a good airing and wash if it needs a bit of a refresh. 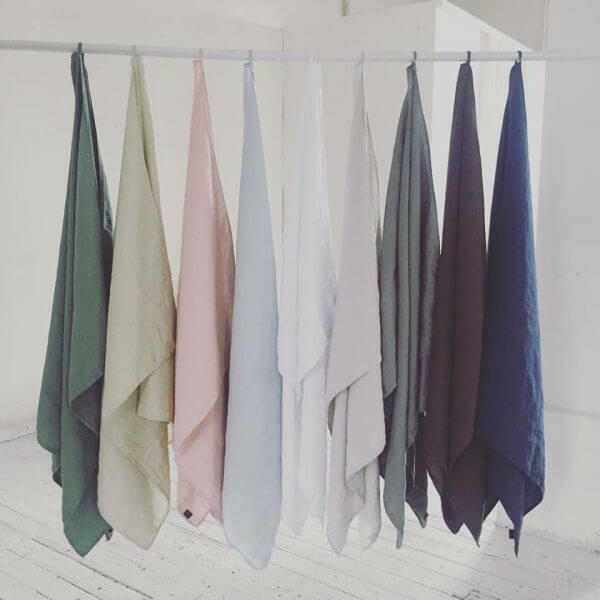 You can see why we love linen – not only does it look stunning, it’s also machine washable, tumble dryable and doesn’t require any ironing if hanged or laid flat when still damp. Easy! Just got this beautiful flax woven top sheet from the antique flea market. The company where it came from is already closed. Vendor has no clue how to wash it. The tag only says c.1890 Woven Flax Top Sheet and no washing instructions or tag. It has some embroidery and detailed with double looped drawnwork on one edge. What is the best way to wash it. Would love to use it. Lucky! I have been hunting for antique linen but not having any luck. I would hand wash it in cold water and dry over a rack. Be careful of the embroidery if it is colored. Enjoy! Hello. I’m wondering if linen always shrinks, even when using cold water to wash. I bought a new white linen shirt and it’s a perfect size right now and worried it will shrink when washed. Any suggestions would be helpful! It really depends if the fabric for making your shirt was pre-washed or not. If it was pre-washed then there shouldn’t be any shrinkage in washing in up to 40C. If it was not pre-washed then there will be some shrinkage even in washing in cold water. In one or another scenario it is not recommended to wash it in temperature above 40C. Thanks for nice article !! Help! I bought fabric that is 55% cotton and 45% linen to make into panel curtains. There are no washing instructions for the fabric but the sales person told me I should never ever wash linen. I’m always washing both 100% linen and linen/cotton blends. I don’t know what could be a reason the sales person told not to wash. Yes it should shrink after first wash, but if you plan to wash your curtains in the future it is good idea to wash the fabric before making your curtains if the fabric was sold not prewashed. The shrinkage depends on manufacture, but composition 55% cotton / 45% linen could probably shrink 3-5% in the worst case scenario. The fabric could easily wrinkle a bit after washing, but it could be ironed without any problem. I would like to have linen slipcovers made for my sofa & chairs. Could you please tell me what weight linen is most desirable for furniture slipcovers? Also, any special instructions for using linen slipcovers or anything else I should know before purchasing linen fabric for slipcovers? Thank you in advance for any advice you can offer to me! There are couple of aspects to consider here. The recommended quality of linen fabrics for slipcovers would be between 200 g/m2 and 350g/m2. Obviously the lighter fabric would be a bit softer and the heavier one more durable (in case it will be used intensively). I bought a pink duvet cover and pillow shams but they are brighter than i want. I would like to fade them a little. I know bleach is out of the question. Do you have any suggestions? I have an upholstered linen chair. Over the it looks dingy. Of course I can not put it in a washing machine! How should I clean the entire chair? I hope this article would answer your question. Reading the various questions and answers it would appear that linen clothes should generally be washable, but in one answer you say that suits may need to be dry cleaned due to their construction and to follow the manufacturer’s recommendations. I have an off white pair of linen dress pants that say dry clean only. They are NOT from a suit. How risky would washing them in cold water be? Thanks for sharing good tips for linen clothes. Do I have to apply starch for linen sarees like cotton?? Yes you could apply starch for linen sarees exactly the same way as for cotton ones. Is linen cotton shrinks? I mean slightly size decreases??? Yes it will if it was not yet washed and it shrinks even more than 100% linen. Account for about 10% shrinkage. Thanks in advance for your help. My sister’s tenant recently washed her linen curtains. They have not been washed before. I know washing should help soften them but it seems to have done the opposite – they feel rough now (and shrunk). Any thoughts on what she should do. Maybe try re-washing them? I wondered if it might have been the detergent that was used.. The key is not to use high temperatures washing linen items that could have caused the shrinkage. You could use regular fabric softener for softness – that should help. Unfortunatelly there is no easy fix for undoing the shrinkage. You could try to hang linen curtains still wet after washing (that should do a bit of work, but definitely not all the way). Some linen curtains have double borders at the bottom, so you could regain the length by redusing the size of that border with a bit of sewing work (if you don’t feel comfortable with that – take it to professional seamstress). Does Linen stretch out with wear? No, linen is one of the few fabrics that doesn’t stretch out with wear. what fabric softener should i use? First of all I would recommend to take a look at washing instructions. Be prepared that your linen curtains might shrink by couple of cm once you wash them. There is no special softener requirements. You could use regular fabric softener for this purpose. Steaming is a good idea as well – it should definitely work on big wrinkles. What a great site! Looking for some softening tips…I’ve clearly read too much and am now a bit confused on best method to soften. I picked up a super cool square table cloth that I’d actually like to use as a scarf- but it’s not quite “drap-ey” enough and a bit scratchy. Is there a wash method you would recommend? Thanks so much! recommendations would depend on the type of fabric that tablecloth is made. Obviously the softest linen you can get is using stone washing method, but at home conditions I would suggest to use regular fabric softener first and see the effect. Good linen is getting softer with every wash, so you’ll need some patience in the process as well. Unfortunate incident led to bike grease staining my linen bed sheets! Soaked and washed them on my first instinct but the stains remain .. Any tips? Thank you for your note. It’s really unfortunate incident as my experience tells it might be very difficult to do that without a help of professional cleaner (I would consider that as an option). Some oil based stains could be cleaned with the help of WD-40 (yes WD-40, some people reported me success using lighter fluid as well). You could try spraying the stain with a little of WD-40, rub it in, and then wash in the machine as usual. This method could cause discoloration of the fabric, so test it on a small, inconspicuous area before applying this method. I have had good results getting oil stains out with dawn dish soap. It has never bleached my fabric, but I have read that it can. So test a small spot first if you are worried. It may be too late for this, but I also never dry in a dryer until I get the stain out. Drying tends to make the stains stick. Clorox 2 has also been effective for me, and resolve carpet stain remover when almost nothing else will work. Let cleaner sit on stain over night, wash in the morning. Air dry, do it again until stain comes out. I have a set of 100% linen bedding. It’s a pale stone grey in color (so bleach is out). How can I wash them to get rid of the yellowing? I’ve read using borax and white vinegar helps, but is this safe to do on linen? It’s perfectly fine to use vinegar. Borax could be more effective on stains, but could have some effect on color. 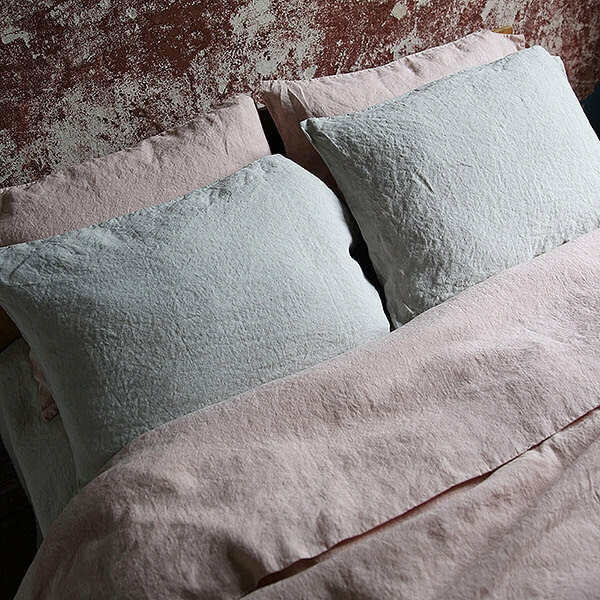 If you say that your bedding is pale grey then the fading effect will probably be very difficult to notice. Hi- Do you have a specific detergent brand you can recommend for washing a beautiful Italian linen dress? I wouldn’t go for recommending specific brands, but I would suggest better to use mild detergent for delicate / gentle washing. There is plenty of choice in the market. Use gentle / low temperature cycle on your washing machine. I’m about to buy some 100% linen dresses and tops. Do I have to buy a size up? Some are loose fitting and others tighter fitting. What’s the difference in shrinking between the cheaper, mid and more quailty linen? Thank you so much in advance. It really difficult to comment on other manufactures clothing. The key thing is if they pre-wash fabric before making clothes (usually cheaper ones don’t). I could say that all LinenMe clothes are pre-washed, so the shrinkage shouldn’t be taken into account at all and you should buy your regular size. I’ve bought a clothes- and it’s said made from cotton linen. I’ve heard that we need to soak that clothes for 2 hours before we can do any altering. It is true? And after 2 hours soak, i can just use fabric softener and dry cleaning it as usual? The only difference between cotton linen and 100% linen is that cotton linen shrinks a bit more. So you should be even more careful with temperatures. I would suggest not to soak. Wash regulary with at lowest temperature (you could add fabric softener) and don’t use tumble dryer. Depends if manufacture pre-washed the fabric before making clothes or not. We at LinenMe pre-wash all our clothes, so they don’t shrink anymore when customer washes them. I know that fabrics made from animal products, such as wool and silk, are mainly proteins and they shrink in hot water because the heat of the water essentially cooks the protein in a manner that is similar to egg whites cooking – it is a one-way process that hardens the fabric. But linen is not protein, in fact I thought it was mainly cellulose, so what is the process that causes it to shrink? Thank you for this question. Yes in fact linen (flax) is natural cellulose fiber. When the clothes are washed, they soak up a lot of water, swelling up. Then when they dry they shrink to their normal size, and start curling up which makes them a bit smaller than they originally were. The water molecules also act as a lubricant between the cellulose molecules, easing the way to get close to each other. This effect is strongest on fibers which absorb most water, especially cotton, linen, and wool. Hope this helps. Hello bought linen pants on eBay and they have been dry cleaned! Yikes.Will washing bring them back to softness? It will, but you have to be careful as if they were not pre-washed (normally it should be as e.g. we pre-wash all our LinenMe clothes) then it could shrink a bit. Use lowest possible temperatures when washing. Hi. I bought a dress that is a mix of rayon, viscose and linen with a polyester lining. Can this be handwashed? The label says dry clean only. I’m sorry, but my expertise is in 100% linen and linen / cotton blends. In your case I would suggest to follow the label instructions or contact manufacture directly for advise. Don’t laugh, but I am looking for a way to get that crinkled look in some linen jacket. Just the opposite of what everyone else is asking. I will start by washing them a lot. Any help would be appreciated. Thank you. For me linen is also all about wrinkles :-). Wash it without fabric softener and wring hard before hanging to dry. That should helpyou to get desired crinkled look. Yes, it is recommended to wash before sewing as it not only make it softer, but also help you to avoid problem with sizing (as linen fabric shrinks the most after the first wash). For softening use regular fabric softener when washing. I have some beautiful Irish linen tablecloths that I washed in the machine after use. There were a few stains that ended up yellowing several spots on the linen. Is there any way to whiten them up? You need to use fabric softener during washing process. Alternativelly you could add vinegar or lemon acid, which will soften the water and the items will soften after washing. I have linen fabric that was given to me in 1960… 57 years ago. I have hand-embroidered all over it. Would it be safe for me to wash it? I’d rather not risk it as the result here is really unpredictable. I would show this piece to dry cleaning specialists for their opinion. If you still take a risk to wash it I would suggest hadwash at low temperature. If instructions say don’t wash I would suggest to follow instructions. If it is good linen fabric it should get softer even after first dry cleaning. It will for sure get softer with time. Thank you for your linen care tips. I have just bought few linen cloths for shirts. The shopkeeper said put the cloths in water before giving for stitching to avoid shrinking. But when I put into water the colors of cloths began coming out. Is there any tips to keep the colors without going while washing. The only tip I could give you is to use the lowest possible temperatures in your washing machine and dryer. In this case I sense that it might be an issue with dying quality of the fabric you bought. You could check LinenMe fabrics they wouldn’t have the issue you describe. I have floral linen fabric which is white taupe and navy. Will the colour run when washed? You have to look at manufacture instructions or contact them directly in case you lost them. It really depends on how the fabric was dyed or printed. If it is good quality fabric you should be able to wash it in low temperatured though it is also normal that after many washes the colours will slightly fade. Thank you for all of the helpful tips about linen care. I’m moving to another state and I would like to ship my summer linen clothing to my new home. How should I pack my linen clothes so that it’s safe to ship them via UPS? There wouldn’t be any special requirements for shipping linen clothing vs. any other clothing. JUst put them in plastic bags for clothing and pack them in carton boxes. I didn’t see a mention of linen shrinking. Does that happen either during washing or drying? I just bought a linen sheath dress and a pair of wide-legged pants and my concern is that they’ll shrink. I’d prefer to be able to throw them in the dryer, but I don’t have to. Linen fabric shrinks that is the fact. Depending on the weaving technique it can shrink 2-5%. It shrinks the most after the first wash and even more if you use dryer for the first time. With linen clothes it is better to avoid dryer if possible, if you use it use lowest temperature setting. We make all LinenMe clothes from pre-washed fabric, but other manufactures make linen clothes from not washed fabric then it is the best to buy linen clothes one size bigger than your size. I noticed there were only women that responded! I just bought some great linen shirts and I appreciated the information that you have above. I do the washing the majority of the time. Thanks Joe! Great to hear that you found it helpful. Try to wash couple of times it should get a bit better, but the best tip going forward is to iron linen shirts inside out. After many war rings my linen shirts have become soft. I like them to have more shape. What can I do to add body? You can try to add cornstarch to the rinse cycle (2 tablespoons cornstarch dissolved in 1 cup cold water) to add body and crispness. Use spray-on starch or fabric sizing for areas like collars and cuffs that you want particularly crisp. The starch also helps to protect the linen from stains. Hi, My mother accidentally washed my 100% linen bedding with regular detergent and then put it in the dryer until it was hot/dry. It was very soft initially, but it is rough and crackly now. I think it will still fit my bed, but will it soften again with time? Is there anything I can do to soften it (put natural oils back in it somehow, or wet it again and dry it gently), or will it soften as it absorbs moisture from the air? Regular fabric softener should do the work. Use it every time with your next washes and use dryer only on low temperatures. Both 100% linen and cotton linen mix will wrinkle. The more times you wash 100% linen it becomes softer and more beautiful, so I would recommend 100% linen. I am making slip covers for dining room chairs and the fabric is linen. Should I wash the fabric before making the slip covers? Linen fabric shrinks 2-5% after washing, so if you plan to wash your slip covers at any point of time in the future the suggestion would be to make slip covers from pre-washed fabric. Can you please give me some suggestions regarding pre-stitching care for linen? I have linen fabric and it is of good quality. I want to make shirts and trousers out of it. But I am not very sure what precautions should i take before getting it stitched and how linen stitching is different from cotton stitching? Depending on the quality of your linen fabric it can shrink as much as 5% after the first wash I suggest you pre-wash it before stitching. What about dying linen? since you recommend washing in cool water, do I need to use cold water dye? There are different linen fabric dying techniques and I would really recommend to follow instructions of dye manufacturer. My experience tells that it’s harder to fix colour with cold water dying and fades more. I bought a linen dress with hand embroidery. The dress is red and the embroidery is white and black. Is it safe to wash it? I would like to soften the fabric by doing so. Thank you! If it is LinenMe dress then I could guarantee that it is safe to wash. If itis not then I would suggest to check manufacture recommendations as some risks could be involved (colours, shrinkage, etc.). If linen fabric was not pre-washed it will shrink a bit, but less than machine wash. Use low temperatures when washing to minimize shrinkage. I have had long drapery panels made. They are quite wrinkled. It’s my inclination to steam them while they are hanging. But was told to never steam linen. I do not want to take them down. Should I just live with the wrinkles, or what would you suggest? Of course it is always recommended to check manufacture instructions, but if your drapery panels are made from a high quality linen fabric then you could steam them while hanging and it will help to remove wrinkles. Thanks for this info! If I hand wash my husband’s expensive linen shirt, is it OK to use the powder soap or shall I use the cake soap, like the sunlight bar soap? Powder soap is fine. Wash it in lukewarm water. Thanks for your question. Unfortunately linen is famous of it’s creaseness and even if you use fabric stiffener it will crease 🙂 Personally I like creased linen more then ironed and do not iron any of my linen clothes or linens. We bought a linen kitchen towel with a picture on one side. When we got it, it had been folded in quarters and had creases where folded. What is the best way to get the creases out, being we want to frame it. The only suggestion I have is – to iron it. If you still have folding marks, then please wash it and then iron. Folding marks should disappear after this. Have a old linen piece with crochet work done by my grandmother. It has lots of stains and I wonder the best way to clean it or if they have been in it so long that they might never come out. It’s hard to say without seeing these stains. I would put piece in the warm water with some soup and leave for few hours. Then I would wash by hands. You could try to put some stain remover somewhere in the corner to test if it’s not damaging the fabric. I bought some old nightwear pyjamas in linen you know the one with the initials on the front and they are really stiff. How can I make them soft and smooth? Thanks for your question. I usually use some fabric softener, when I do my laundry. It makes all fabrics, including linen, very soft. Today I participated on a 1600-th century Kulturday. It was a detailed care instruction for the precious linnen fabric, do not- ever was or keep linnen in higher than 80 degrees celsius. It is good to iron damp linen, because the fibers get pressed together…- this was the take home message for me, I use heaps of linnen clothing, and I did not iron them at all, but allas many of them got damaged, because the fibers loosened up for the lack of ironing, strill remember no hotter than 80 degrees celsius, linnen crazy Marija Stockholm. Make that “storing”, or “stowing”, if you’re feeling nautical! Either way, I’d heard that linen can rub itself to bits over time if folded against itself – hoping you can take some of the “myth-ery” out of it all! I love my linens! Ooh, just 1 more: do embroidered linens require linen thread materials for the embroidered areas not to pull/pucker? Ok, another stoing linens question. Does one or doesn’t one bother to fold acid-free tissues twixt the folds of the fabric when storing? Hah, 2 pts, used the word ‘twixt”, hee! I just purchased linen slipcovers for my kitchen chairs. These WILL get stains on them. Love look and feel of linen. What is best way to treat the daily stains? Thx! Thank you for your question. Every textile product has to have care instructions sewn into the seam. So my suggestion would be to wash based on this info. If it is a good quality linen, it should be possible to wash at 40 – 60 degree. I wouldn’t put slipcovers in the dryer as they might shrink. Thanks for the information. My eyes opened wide from a sound sleep this morning after remembering my husbands brand new white linen shirt was dry in the dryer! I rushed to look at it hoping it wasn’t ruined……..it looks ok I think….wondering if I should wash it again now and let it hang to dry? In the worst scenario what could happen is that your husband’s shirts would shrink 1 or 2 sizes 🙂 This usually happens if linen is not the best quality or washed and dried at high temperature. I understand, that nothing terrible happened 😉 If it didn’t shrink this time I shouldn’t shrink on next. Thanks for the info. Right to the point…I like that. Was wondering though, should I use fabric softener when washing my linen pants? I always put softener when I wash my linens 🙂 It makes such a big difference. Thanks for the info. On this article. I just purchased tablecloths of linen. I hope I don’t mess it up though! Lol. Thanks again. I’ve bought a new linen jacket which is very nice. But, after I hand wash it, it is so wrinkled. I hesitate to iron it, since too much work in ironing a callous jacket. How do I get rid off the wrinkles after hand washing. Thanks. I’m sorry to tell you, but if the fabric contains at least 5% linen it wrinkles. My suggestion would be to hang your jacket when you take it from the washing machine and while it is still wet. Large wrinkles will go out naturally. If you prefer ironing, it would be a good idea to iron while the fabric is still damp. Personally, I do not iron any of my linens 🙂 I love when they are a little crumpled, because then you can see that this is a natural product. If you are drying your cloth out in a dry machine, the best way to avoid wrinkles is to take it by two of its ends and make it crack like a whip a few times. All the wrinkles will go way. Then you put it to dry, simulating the way how you wanted the creases on the cloth to be. It works for any kind of cloth, not just for linen. Thanks for this article. I was debating whether or not to buy a linen top and you gave me the courage I needed. Linen is rumored to be very cool in TX heat. Now I know it’s easy to care for too.